Castlemartin Tanks - 'Romulus' and 'Remus'. Tanks outside Merrion Camp , Castlemartin . 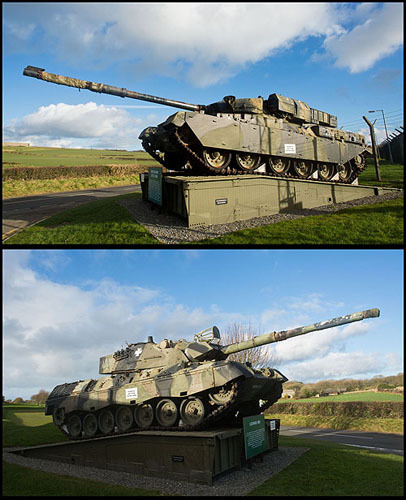 Top Pic - 'Remus' 2 - A Chieftain Main Battle Tank Mk11 , in service between 1965 and 2003 , armed with a 120mm gun. In 2009 the Tank was moved from Western Way - Pembroke Dock , where it overlooked the ASDA supermarket. Bottom Pic - 'Romulus' 2 - A German Leopard Mk1 Tank , in service from 1965 , armed with a 105mm gun.